Even with a regulation helmet, motorcycle operators who are involved in accidents tend to sustain serious head injuries, with some even coming away with life altering brain injuries. 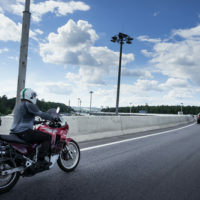 Depending on the severity of the injury, an accident victim may experience a drastically reduced quality of life as they discover that everything from working to sustaining healthy relationships is difficult if not impossible, which is why a victim should always seek the advice of an experienced Miami motorcycle accident attorney following an accident. At Spencer Morgan Law, our personal injury attorneys use our experience, negotiation skills, and knowledge to help the victims of accidents fight for the compensation they need to recover in comfort. Though we cannot give victims back their lives, we can help to make sure that they are financially stable throughout the healing process and beyond. If you or a loved one sustained serious head or brain injuries in a Miami motorcycle accident, reach out to our law firm for legal assistance today. A host of emotional issues. As you can see, everything on this list is life altering. If a victim experiences multiple symptoms, which most people with TBIs or CTEs do, they may have trouble retaining a job, sustaining healthy relationships, or leading a fulfilling life in general. CTE and TBI are just two types of brain injuries one may sustain in a motorcycle accident. For a comprehensive understanding of the various types of head and brain injuries and their symptoms, visit the Brain Injury Alliance of Utah. At Spencer Morgan Law, we understand how complicated a serious head or brain injury can make a person’s life, which is why we have dedicated our lives to helping victims of motorcycle accidents, car accidents, and other personal injury cases recover settlements that can at least provide them with some semblance of normalcy. With the right motorcycle accident lawyer on your side, you can win a settlement that covers the cost of medical expenses, past and future lost wages, loss of consortium, mental health counseling, loss of enjoyment of life, and more. To learn more about what it takes to build a foolproof case, reach out to the team at Spencer Morgan Law today.